An unlikely candidate for one of the most beloved birds of spring, this squat, neckless weirdo nevertheless invokes breathlessness upon seeing its spring mating ritual. Belonging to a family of water-associated shorebirds, this bird somehow ended up living its life away from water in early successional woodland, shrubland, and grassland. Its heavy looking body and short legs are not all that unusual when compared to its buzzy and bug-like “peeent” call that the males make during courtship. Is this bird an ugly duckling? Well, not exactly. Though its mish-mashed body and habits suggest drunken design, the American woodcock somehow maintains a level of coolness and popularity that overcomes its oddness. These birds can be reliably found in open areas surrounding woods, savannas, and thickets. Their performances begin at dusk, starting with a single peent and climaxing here at Faville Grove with dozens of birds peenting, twittering skyward higher and higher, and falling from the sky like a shot plane, only to land in about the same spot with a declaritive “peent!”—a reaffirming declaration that the woodcock did indeed survive what looked like its certain death. American woodcock overwinter in the Gulf states and have returned to Wisconsin in the past month or so, migrating in darkness over Midwestern states. You can see their wonderful mating displays on Madison Audubon's free field trip on April 18 from 6:30-8:30pm at Faville Grove Sanctuary. We will meet at the kiosk at W7480 Prairie Lane. This date happens to be one day after the median egg laying date, according to the first Breeding Bird Atlas. Just a week ago, we led two visitors on a cold and gray evening to watch the woodcock. Our expectations weren't high. As we settled into our spots along the ledge savanna, it soon became clear that we were at the center of the stage for these performing birds. Woodcock came flying out from the savanna right at our heads, twittering as they ascended into the slate gray heavens. One bird reached its peak in the sky, then fell earthward chirping and making a whistling noise as air passed through its primaries, and landed not ten feet from us. It sat there and peented, this squat and singular little bird, delighting the viewers for about a minute. What a strange and delightful spectacle. Woodcock also have a strange effect on other birds. Where woodcock are found peenting and displaying, bird numbers and diversity are more than 1.5 times higher than in random forest plots. 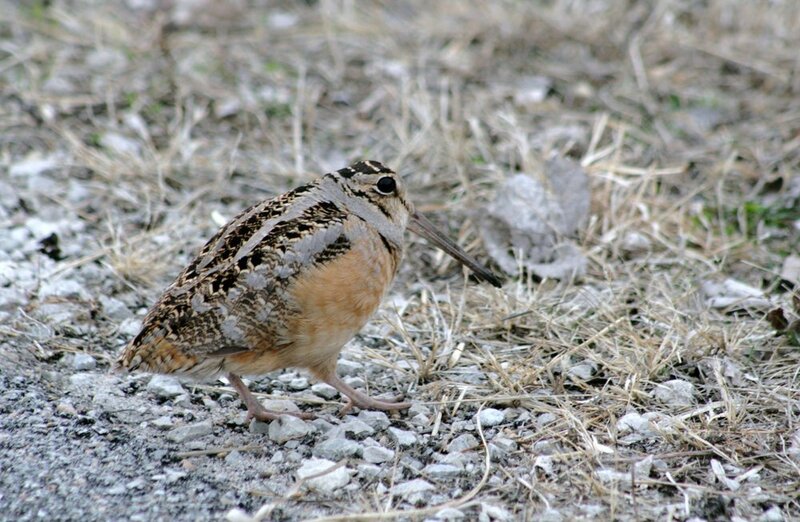 In part, this makes sense because of the diversity of habitats that woodcock use, from foraging in oak woods during the day, to performing in open prairies in the evening, to nesting near shrub thickets or at the base of trees. Come join us next week and enjoy the spectacle of the woodcock at Faville Grove!